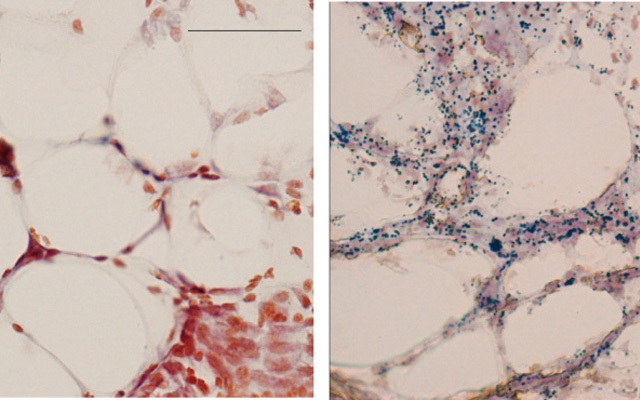 Gram staining image depicts fat in mice after exposure to S. aureus bacteria. Left, normal fat cells. Right, fat cells without antimicrobial peptide CAMP. Blue dots indicate presence of bacteria. Richard Gallo, MD, PhD, professor and chief of dermatology at UC San Diego School of Medicine, and colleagues have uncovered a previously unknown role for dermal fat cells, known as adipocytes: They produce antimicrobial peptides that help fend off invading bacteria and other pathogens. “It was thought that once the skin barrier was broken, it was entirely the responsibility of circulating (white) blood cells like neutrophils and macrophages to protect us from getting sepsis,” said Gallo, the study’s principal investigator. The human body’s defense against microbial infection is complex, multi-tiered and involves numerous cell types, culminating in the arrival of neutrophils and monocytes – specialized cells that literally devour targeted pathogens. Co-authors include Tissa Hata, UCSD; Christian F. Guerrero-Juarez, Paul Ramos and Maksim V. Plikus, UC Irvine; and Sagar P. Bapat, The Salk Institute for Biological Studies. Funding for this research came, in part, from the National Institutes of Health (grants R01A1083358, R01A052453, AR052728, DK096828, R01AR067273, GM055246), The Atopic Dermatitis Research Network, the Edward Mallinckrodt Jr. Foundation, the Dermatology Foundation, the National Science Foundation and the California Institute for Regenerative Medicine.